When I first heard the pianist Michael Kanan play, I was astonished by his quiet lyricism, his gentle wit, his ability to construct something orchestral and memorable out of the simplest materials. Like his heroes Jimmy Rowles and Hank Jones, he is a poetic player. That doesn’t mean, in Michael’s case, that prettiness outweighs substance. His playing has a stealthy power, an impressive integrity. But it does mean that he is one of the questers in search of beauty, believing that beauty can transform the world, making its sharp edges smooth, its harsh contours welcoming. Michael and very eminent friends will be appearing at Carnegie Hall on Wednesday, March 30 (8-10 PM). The friends are singer Jane Monheit, guitarist Greg Ruggiero, string bassist Neal Miner. For those who like to have the route mapped out before they get in the car, the format of the concert will be solo piano for several songs, then a duo set with Jane, intermission, a trio set with Neal and Greg, and at the end Jane will join the trio. Again, the necessary details. Weill Recital Hall at Carnegie Hall, 57th Street at 7th Avenue. Wednesday, March 30, 8-10 PM. Tickets: $35 ($15 for students / seniors) — on sale now at Carnegie Hall box office, (212) 247-7800. More information at www.abbywhiteside.org and www.carnegiehall.org. I will be there, but obviously without a camera: so I’d encourage those who love subtle music to make a pilgrimage to Weill Recital Hall for that evening. Where were the people with the recording equipment? James P. deserved so much more recognition and attention than he ever received. A postscript. This just in! I don’t think James P. was recorded often enough, even though his (intermittent) discography covers more than thirty years. And I thought I had heard all the available recordings . 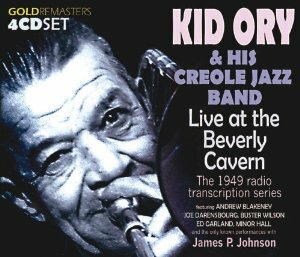 . . but then I found this 4-CD set on eBay, 1949 Kid Ory broadcasts from the Beverly Caverns — where James P. fills in for Buster Wilson six times. Acquiring this set might require some active web-detective work, but it is heartening to know that there is more James P. to be heard. Posted in "Thanks A Million", Irreplaceable, Jazz Titans, Jazz Worth Reading, Swing You Cats! Although I am not traditionally religious, I think jazz and creative improvisation are holy. One of the great puzzlements for a devout jazz listener like myself is that some people in bars and clubs where musicians are playing talk through performances. Given the greater formality (and higher ticket prices) of a concert hall, this is less likely to happen. Of course, there are the coughers and unwrappers of candy. I once met an erudite devotee of classical music who told me that coughing in a concert hall was the response of those who could not endure that the artist was on the stage and that they were not. To him, it was the revenge of the untalented, a belligerent assertion of their egos. But in a club, where drinks, food, conversations are the rule, the talk flows freely. This bothers me because I come to hear the music. I didn’t come to a club to hear someone hold forth about his diverticulitis. In another context, I can sympathize, but I’d rather hear the band. Although I celebrate romance, I don’t want to hear loud flirtations. But I know that the world is not my private salon, so I confine myself to eye-rolling and occasional grimaces. Neither response is subtle or adult, I admit, but they are preferable to direct confrontation. On rare occasions, when I am videotaping and am entrapped by loud talkers, I have said, as sweetly as possible, “I hate to bother you, but I am doing this for YouTube, and your conversation is going online.” That usually works. Some may perceive my behavior as that of a spoilsport, and I apologize if I have ever really ruined someone’s fun. But I think that some of the rudeness I encounter is cultural ignorance. If you and your Beloved make a pilgrimage to The Ear Inn or Carnegie Hall at a specific time to hear a particular group of players, that establishes a purpose. You might not be silent, but you understand what paying attention means. But live musicians are not human versions of Muzak or an iPod, and they deserve respect and love for what they are attempting for our pleasure and theirs. I won’t fulminate about the silent yet tangible disrespect afforded artists by those people — not always young — who hunch over their iPhones and text throughout the evening while the players are performing. I want to ask such people, “Why did you leave your apartment if that was all you wanted to do?” I know that the club or bar provides — in its lights and population and rustling — a semblance of community hard to find otherwise, which I think is sad — a subject for another meditation. Then there are the people who talk loudly through the whole performance only to whoop loudly at the end. How much can they have heard, even given their splendid multitasking? What I’ve written isn’t purely Luddite. Sixty years ago, when John Hammond, who loathed Hazel Scott, conspicuously read his newspaper while she was playing, it was an equally distasteful, even aggressive act of contempt. In conversations now and in the past that I’ve had with musicians, I thought, perhaps stubbornly, that they would agree. Perhaps they would be even more irate. Improvisers, creating beauty, working hard, deserve respect, and respect was shown in listening: being present, paying attention. The first comment is self-protective. The jazz club isn’t a recording studio — silent, nearly sterile, where every inhalation can be heard, every imperfect note saved for posterity. If the audience is chatting, then Musician 1 is free, relaxed: if no one is listening hyper-closely, it’s easier to experiment, to take chances. The second comment might sound rueful, reisgned — the jazz player’s version of the Serenity Prayer: adapt to the circumstances you can’t change — but it was said to me with the sweetest of smiles, no irony, no edge. Music, for this player, creates a loving atmosphere, so it would be futile or unkind to force people into silence. The third comment echoes the first two but highlights a truth that many clubowners and bartenders know. Some jazz-lovers (although there are certainly exceptions) are so intent on the music that they forget or don’t care to spend money on food and drinks. To Musician 3, reverent silence means less in the cash register and the band isn’t invited back. Two small codas need to be stated here in the name of accuracy and candor. One is that musicians chat among themselves while on the stand during someone else’s solo. Jokes, everyday chatter about the car repair, about getting one’s horn fixed, about the lousy meal just consumed, are part of the gig, perhaps to break up the long spaces when someone else is playing. 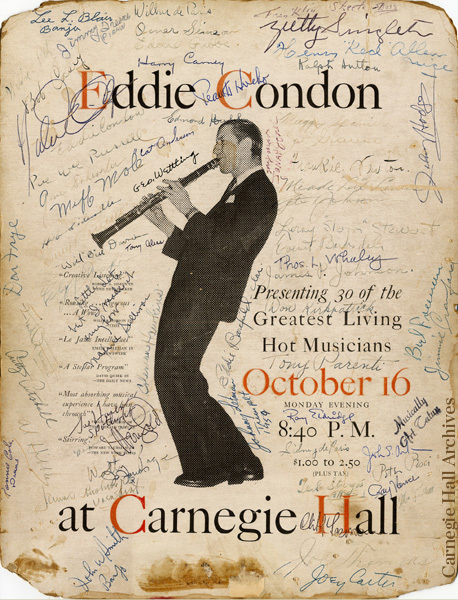 When I went to the last “Eddie Condon’s,” it took me a long time to get used to the undercurrents of dialogue on the stand. I was hardly about to attempt to shush Ruby Braff. And if you listen to the recordings of radio broadcasts: “Dr. Jazz” at Eddie Condon’s; the Ellington band at the Cotton Club; Fats Waller at the Yacht Club, Bird and Diz at the Royal Roost — the audience is not shouting, but they are audible, they’re shifting in their seats, quietly chatting. Was there ever a properly hushed environment in which the holy art of jazz could flourish? Or is my desire for near-silence — the better to hear the glories of the music — unrealistic? I wonder. I dream of a club or bar filled with people who love the music as much as I do and are as a result quiet . . . but until that happens I think I’ll have to learn the lesson of patience and save my glaring for the truly egregious cases of high-decibel rudeness. 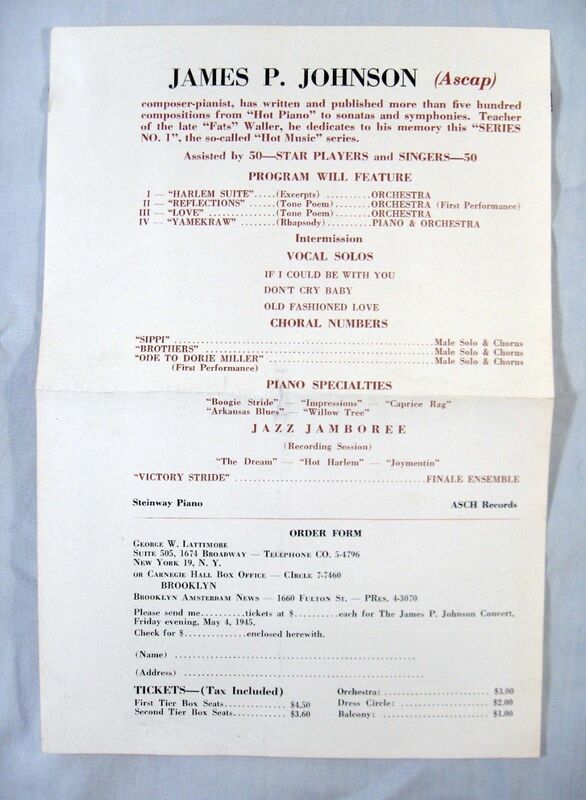 Like many other jazz fans, I first heard the name Bill Savory in the liner notes (by George Avakian) to a series of Benny Goodman airshot performances issued on Columbia Records after the astonishing success of their 1938 Carnegie Hall jazz concert issues. 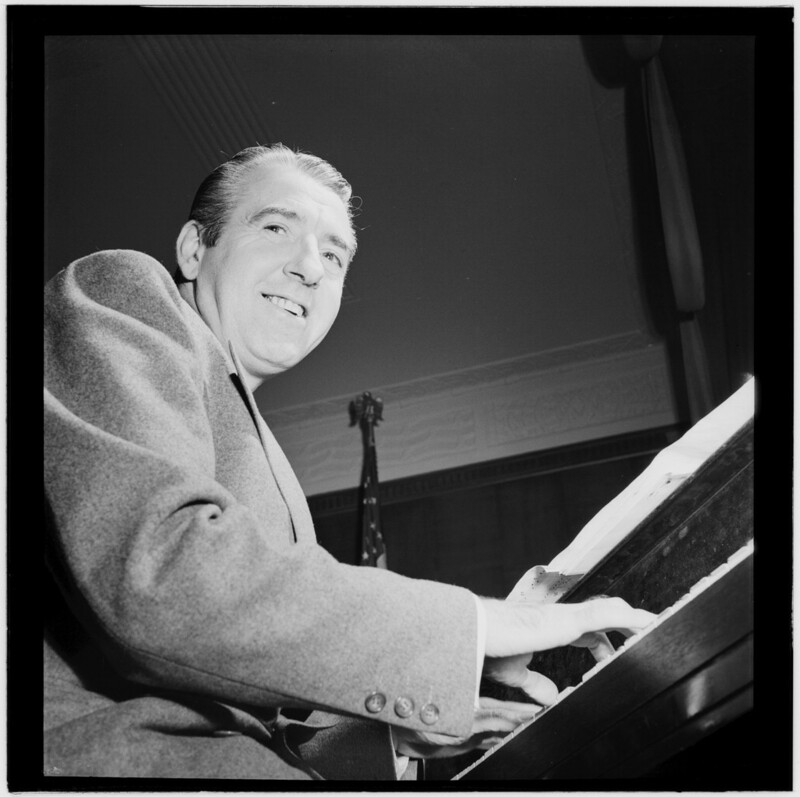 I learned that Savory was a pioneering engineer, friend to many jazz musicians, with a special fondness for Goodman and his associates, who had made disc recordings of radio broadcasts in the Thirties. Some memorable performances had been made available through his devotion to the music: one that I can hear in my head as I write this was a Goodman Trio version of SWEET LEILANI, complete with energetic tom-tom playing by Gene Krupa, that gave the demure Hawaiian maiden a decidedly uptown flavor. Through the various Goodman discographies, I later learned that Savory’s collection was substantial. But that was where it ended until recently — where, in the New York jazz circles I frequent, I began hearing rumors about those discs. How about music from the fabled Randall’s Island Carnival of Swing, which has existed only as silent newsreel footage of the Count Basie band? 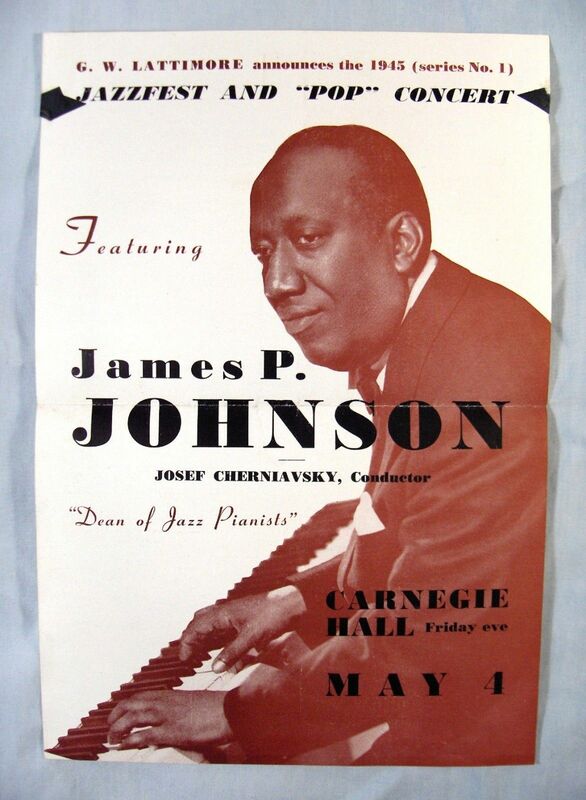 How about performances by Goodman (of course), Teddy Wilson (once on harpsichord), Leo Watson, Louis Armstrong, Chu Berry, Mildred Bailey, Lester Young, Herschel Evans, Charlie Christian, Coleman Hawkins, Lionel Hampton, Bunny Berigan, Bobby Hackett, Billie Holiday . . . . ? The collection has been brought to light through the long-term and tireless efforts of Loren Schoenberg — not only a fine tenor saxophonist and bandleader in his own right, but the head of the National Jazz Museum in Harlem — who made the pilgrimage to Malta, Illinois, where Savory’s son had kept the thousand or so discs. And who better to take over the difficult job of transferring those that could be rescued but our friend Doug Pomeroy, who decided that he didn’t exactly feel like retiring once he heard some of the music coming from those unique recordings. Now the whuspers have turned into reality, and we wait to hear the results. I don’t know how long — or in what fashion — the music will eventually reach us. Loren has proposed that this musical treasure will become part of the Museum’s digital trove . . . but until that happens, here’s some more fascinating information . . . taken from the pages of The New York Times, which doesn’t often make a point of mentioning Chu Berry in its first section! And (closer to the end of the article) there’s an astonishing video showing the esteemed Messrs. Schoenberg and Pomeroy . . . the latter, a master at work, restoring these treasures. And the Museum will be presenting four programs on these treasures as part of their Tuesday evening JAZZ FOR CURIOUS LISTENERS series, held from 7:00 – 8:30PM at our Visitors Center, 104 E. 126th Street, NY, NY 10035. P.S. I apologize to the New York jazz aficionados, for whom this post is already old news; they have already made their appointments to visit the Museum. This is for my readers for whom New York jazz gossip is not their daily breakfast chat . . . and for the sheer pleasure of writing about these treasures!